Only equatorial volcanic eruptions can spread atmospheric dust in both hemispheres. Thus, the big Indonesian volcanoes like Krakatau (Fig. 1) are suspect for the 535 eruption. Today, on THC's Super-Eruptive Volcanoes Watch we monitor Krakatau again, as well as Pago, in Papua New Guinea. Both of these volcanoes have a history of super-volcano activity, which means that they are capable of producing eruptions with VEIs (Volcano Explosivity Indexes) of between 6 and 8. (An 8 is the highest VEI possible). Figure 1. Tectonic setting of Indonesian islands, showing present-day motion (or subduction) of the Indo-Australian plate beneath the eastward moving Eurasian plate and the resulting volcanic centers of Krakatau, Tambora, Toba, and Merapi. (Adapted from Fig. 6-1 of Zeilinga de Boer and Sanders, 2002). As for climate change, you may recall that when Indonesia's Tambora (Fig. 1) erupted in 1815, it produced enough climate cooling to cause many New Englanders to move to the Ohio River Valley. They had not been able to grow crops for two years in New England and were concerned about their future. Most serious, however, was Mt. Toba's (Fig. 1) eruption, on Sumatra 71,000 years ago. That eruption blew 800 cubic kilometers of ash into the air -- 4,000 times as much as Mt. St. Helens. Toba buried most of India under ash. This was a true cataclysm, as opposed to a less intense catastrophe, because it had significant worldwide effects. An estimated 75 percent of the Northern Hemisphere's plants may have died. At the end of the first six years of climate cooling, a thousand-year ice age began. Perhaps only a few thousand people, living in isolated pockets in Africa, Europe, and Asia survived. Thus, it's just possible that the readings'-predicted "darkening of the Sun" (3976-15) may be severe enough that there will be little or no food to import from other countries, and it may take hundreds of years for a new social reality to emerge. While it seems foolish to many to even think in such terms, Earth scientists are familiar with assessing such possibilities. And as for those who espouse “traditional knowledge,” one Hopi elder has said, "When the changes begin, there will be a big noise heard all over the Earth." Note that the 535 eruption was heard as a low rumble thousands of miles away. If we hear such a rumble, should we not drive as quickly as possible to grocery and drug stores to load up on necessities? As the saying goes, "Trust in God, but tie your camel first." Bearing in mind that the eruption [that produced the catastrophe] had to have occurred in the southern tropics, the area pinpointed by the Chinese account [of a blast heard thousands of miles away to the southwest of China] narrows the field to the southern Sumatra/western Java part of the Samoa-Sumatra volcanic chain. Significantly, there is only one known caldera of appropriate size and vintage in that relatively small (six-hundred-mile-long) area. It surrounds the site of no less notorious a volcano than Krakatoa, the island mountain that brought death and destruction to Java and Sumatra in the 1880s. Could an earlier, bigger eruption of Krakatoa have been responsible for the catastrophe that tormented the world in the mid-sixth century A.D. and changed its history forever? Here the evidence takes a fascinating turn. For buried deep in a little known and normally ignored Indonesian chronicle is an extraordinary passage that may well describe the 535 supereruption itself. 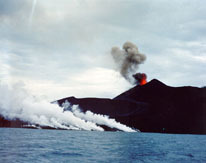 Describing a huge volcanic event in the Sunda Straits area (between Sumatra and java), where Krakatoa is located, the chronicle says that a “mighty roar of thunder” came out of a local mountain (Mount Batuwara, now called Pulosari). The chronicle - known as the Pustaka Raja Purwa, or The Book of Ancient Kings, goes on to state that “a great flood then came from Mount Batuwara and flowed eastwards to Mount Kamula (now called Mount Gede).” It then claims that the eruption was so massive that large areas of land sank below sea level, creating the straits that currently separate Sumatra and Java. All of these events were due to the fact that in A.D. 535-536 mankind was hit by one of the greatest natural disasters ever to occur. The disaster suppressed much of the light and heat of the Sun for about 18 months, causing the global climate to cool dramatically. Evidence of super eruptions can be found in layers of acid snow deposition in the arctic and antarctic ice sheets. Because the deposition of acid snow in 535-540 A.D. was roughly twice as long in Antarctica as in Greenland, this is taken as strong evidence that the eruption that darkened the Sun took place in the southern rather than in the northern tropics. What an American Volcanologist Has to Say About 535 A.D.
K. Wohletz, a volcanologist at Los Alamos National Laboratory, contributed to David Keys's research on the eruption of Krakatau and the great climatic cooling of the mid sixth century. A complete version of Wohletz's abstract entitled “Were The Dark Ages Triggered by Volcano-Related Climate Changes in the 6th Century?” is in the THC article Scientists, In Their Own Words... . There is also an article on the Los Alamos National Laboratory webpage by the same name ("Were the Dark Ages Triggered by Volcano-Related Climate Changes in the 6th Century?") in which Wohletz gives an expanded technical analysis of the presumed 535 eruption. The article includes pictures of the computer simulation referred to in the article. Is Krakatau As Dangerous Today As It Was In 535 A.D.? The short answer to the above question is, from the standpoint of Cayce reading 3976-15, “most definitely.” Krakatau sits astride two fault zones that define a very weak spot in an area of Earth's crust that is under tension. (See Fig. 2).Extension in the Sunda Strait, where Krakatau is located, is caused by differences in the tectonic motions of Java and Sumatra. (See Fig. 1). In Indonesia, this sort of geologic setting is a recipe for super-explosive eruptions. Such an eruption at Krakatau today would be a strong function of stresses induced by a shift of Earth's poles of rotation, as predicted in Cayce readings 3976-15, 826-8, and 378-16. That pole shift is predicted to begin anytime now. Fig. 2. Fault zones of Anak Krakatau, the outline of the original island, and the submerged caldera that formed in 1883 (dotted area). The line joining the volcanic centers is an inferred fault zone. (Adapted from Fig. 7-2 of Zeilinga de Boer and Sanders, 2002). We await the next eruption of Krakatau. The Southwest Volcano Research Center is predicting, with 97 percent probability, the eruption of Krakatau in 2002. Pre-eruption earthquake activity was reasonably strong in August 2002, although it has quieted down a bit at this writing. Subscribers to THC will be notified via eBulletin as soon as we get confirmation of any eruption of Krakatau.